Kevin was on the roof for 168 hours and has raised a total of $41,121.43! Thank you to Kevin, the STRIVE staff and donors for your support! Kevin is a UPS employee and long time friend of STRIVE. 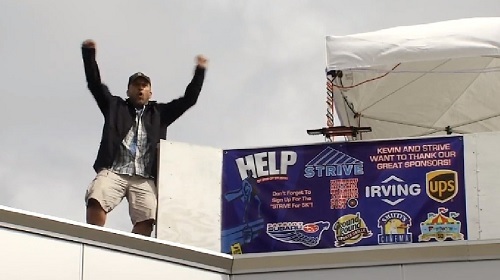 One of Kevin’s greatest volunteer efforts each year is to camp on the roof of Patriot Subaru in Saco until he reaches a certain fundraising goal for STRIVE. . Donations of any amount are accepted. Donors can give online or can give in person by visiting Kevin at Patriot Subaru.